In this book Thomas Ross and Margarete McCallahan brought forward something extremely powerful to help you with the virtually effortless removal of formerly hard-to-remove stubborn, bulging deposits of fat. The recipes are all new and created by chefs from across the globe just for this book, to help you to lose that weight deliciously. In fact, this diet is so strong that it will, depending upon how much weight you’d like to lose, allow you to ditch up to forty pounds of flab, fat and fluids in a mere ninety days. And, as stunning as that may seem, you’ll be able to consume three fulfilling, exquisite and healthy meals each day! Real meals, mouth watering delicious meals, meals that give you that wonderful satisfying feeling that you’ve really eaten when you get up from the table. But, best of all, it’s based on science, factual science, not false claims nor empty promises. • NO unsafe Pills to take. 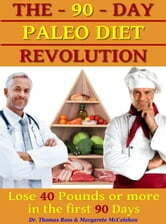 Thomas Ross and Margarete McCallahan are specialized in weight loss and a healthy lifestyle, and especially the Paleo diet lifestyle, for more than ten years. No matter what you’ve been told – trying to lose weight the hard way, the way that requires tons of effort, deprivation, and lots of will power, just doesn’t work! It’s not counting calories or even starving yourself that really makes the difference between a fat unhealthy-unattractive body, and a lean, healthy, beautifully attractive body. This book is ok for beginning a Paleo lifestyle, but could be better. Some recipes are great while others are too complicated for regular dinning taking days to prepare.